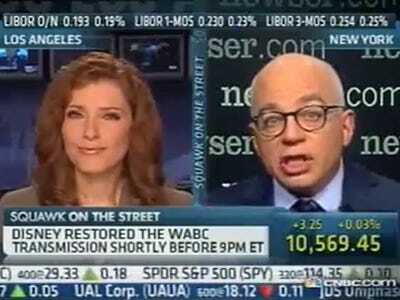 Newser’s Michael Wolff took a little swipe at CNBC media and entertainment reporter Julia Boorstin this morning. A reader alerted us to Wolff’s appearance on Squawk on the Street to discuss Disney’s battle with Cablevision over carrier fees. She says the settlements mean media companies will be able to look for higher fees from other cable providers. “It sets a stage for other negotiations down the line,” Boorstin said. “These negotiations are going to go on but you have to look at a broader picture here, which you seldom do,” Wolff said. Julia’s jaw dropped and she seemed at first shocked, then annoyed at Wolff’s statement. Wolff explained that consumers are beginning to think “beyond the box,” which means cablers will lose subscribers and content providers could lose audience members and have to think about other distribution platforms for their content.